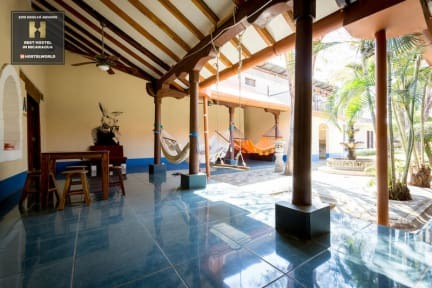 Poco a Poco Hostel has been awarded the best hostel in Nicaragua 2019 & 2018, what an honour! We work hard to make sure our guests have a great time in- and outside the hostel. When you stay at Poco a Poco you will meet a lot of other people and have plenty of spaces to chill. The hostel has a very spacious setup, but you'll be never alone. We try to create a social and open atmosphere for our guests. We have a well equiped open kitchen for you to use, what better place to get to know eachother? Our volunteers organize activities almost every night: taconight, quiznight, cocktailnight, BBQnight, pastanight, walking tour etc. We are centrally located, just a few blocks from the main square and all the sites. A great supermarket is around the corner from the hostel, where you can buy everything you need. Bars and nightclubs are at a 5 min walk. We know the city and the country really well, so if you have any questions: just come talk to us. Our staff is a 100% local, something that is very important to us. Looking to improve your Spanish? They are always open for a chat! We love to show our guests a great time, but we are NOT your typical party hostel. There is no bar, we have a self-service fridge filled with $1 drinks. Everyday we offer breakfast for just $1 too. Poco a Poco Hostel is a SOCIAL hostel, a place where it's about meeting other people and have a good time together. This is also why do some many activities.If you don't to join, no problemo amigo. The 2 owners have travelled a lot themselves and tried to create their perfect hostel. We hope you come and visit us to check it out for yourself. Payment at check out with cash (USD/Cordoba). We do not accept cards. Very nice hostel in the center of Leon, well located, good atmosphere and cool staff! Was just one night but enjoyed. A great hostel. Staff is really helpful and it leads to a really chill atmosphere. There’s always people hanging around. The kitchen is big, and there’s a supermarket 2 blocks away. The air-conditioned dorm is worth the extra money because Leon is scorching. Lockers are big. Bathrooms are always clean. Fridge full of beer, water and soda and brownies that you check out at the front desk. WiFi is good. It’s a place you could stay for a week without even realizing it. 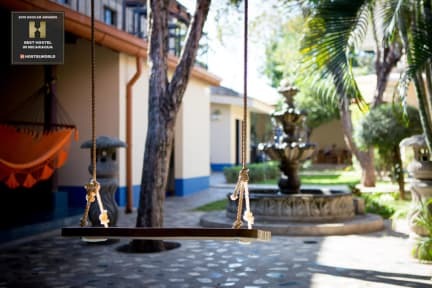 One of the best hostels we've stayed at in Central America! Awesome volunteers and staff, great nightly activities, and delicious brownie. Would 100% recommend staying here! This is a fantastic hostel! Great social atmosphere, but not a party hostel. Beds were comfortable and facilities were good, but the best thing is the daily social activities and welcoming, helpful and friendly staff. Highly recommended! One of the best hostels I have stayed at!! Eric who works on the front desk is a legend!! This is a really good hostel - social and friendly. Rooms are big, they have daily evening events to bring the hostel together. Breakfast is good and only US$1. I just wish there was a pool and a/c in every room as it was hot. I absolutely loved my time at Poco a Poco. It was clean, had a great vibe, and central location. However, above all, my favorite part about Poco a Poco is the people. The staff, owners, and volunteers were so welcoming. I had the pleasure of interacting with Eric, Henry, Darlene, Kara, and Dario during my time there who made my stay that much better. I came to Poco a Poco as soon as I arrived in Nicaragua, and at the end of day 1, I already had a few new lifelong friends! HIGHLY recommend! The owners and all volunteers were really lovely! The hostal itself is reallly clean and each bed has a fan to help deal with the heat at night. Each night they have a different activity which is great if you are travelling alone and want to meet people. I would stay there again!